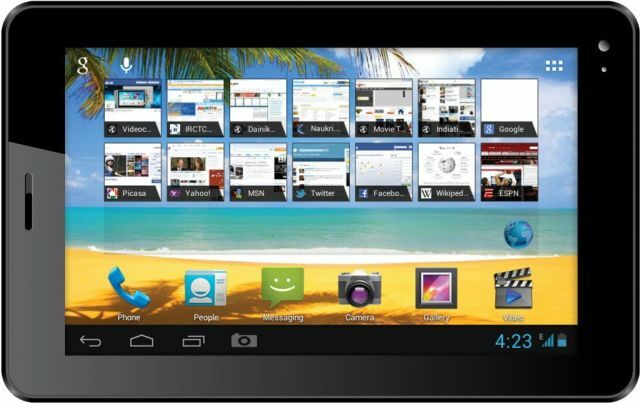 Videocon Mobile Phones launched budget tablet, Videocon VT 75C in Indian market. The device has a 7-inch High Resolution screen, 1 GHz Processor, 512 MB RAM, 4 GB Internal Storage and 3000 mAh battery. The Videocon VT 75C runs on Android 4.1 Jelly Bean and it comes with 2G Voice calling with dedicated SIM slot. The Videocon VT 75C comes with 2 MP Rear and VGA front camera for video calling. The tablet is available in Black and White color. The other features include Memory card slot, Full HD playback, Wi-Fi, 3.5 mm Audio Jack, HDMI, Micro USB support, Bluetooth and 3 GB/CDMA-internet connectivity via dongle. The Videocon VT 75C bundled with preloaded apps like ‘Saavn’-the music app, ‘TOI’ for unlimited access to news and views from across the world, ‘Facebook’ for engaging Social Networking and ‘Skype’ for efficient over-the-internet calling.